Hello hello! It's Monday and the day I get to tell you about my boring weekend ring in the new week with my favorite crafty ladies and DT teamies. I'm being a big tease today and showing you a birthday card. Why, you ask? Because at The Beary Scrap Design Team and Challenge blog, we're celebrating our 1st birthday starting tomorrow. The party goes on all month long and you're going to love it! 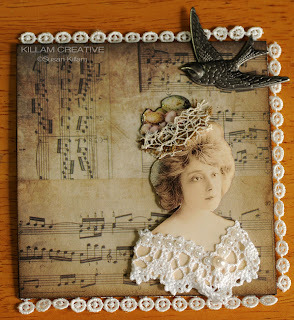 I've used Echo Park's "For The Record" papers and embellishments. 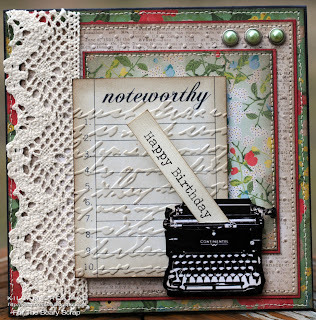 The "Noteworthy" top is from the Noteworthy 12x12 paper, chock full of a fabulous assortment of smaller embellishment pieces. I cut the typewriter sticker close to the design (leaving the backing on) and inked the edges to give it a little dimension (and hide the white backing paper). 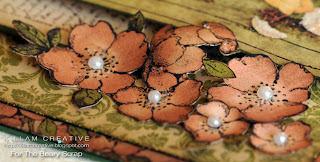 I used Cuttlebug "Script" and "Dots" embossing folders and inked all around the edges with Walnut Stain Distress Ink. The "Happy Birthday" strip was printed on my computer in a cool type font. One more piece of news: Our Guest Designer call is going on for one more week! Please go here for all the details. There is still plenty of time to make a project based on our sketch, so get crafty for your chance to join us for a 3-month Guest Designer term! It's Wednesday and WOYW-day! Want to play and peek at desks all over the world? Join us at Chez Dunnit! We're all keeping it real. Shocked! I was shocked when I saw my table today. (It's not really that bad... I'm just a drama queen!) See, I left it like this in the wee hours Monday and didn't return. Perhaps I even ran screaming from the room... I dunno - I blocked it from my mind. If you've been here on any of my other WOYWW posts you know I need order to be creative. Yea, I know that goes against the grain but it's how I roll. 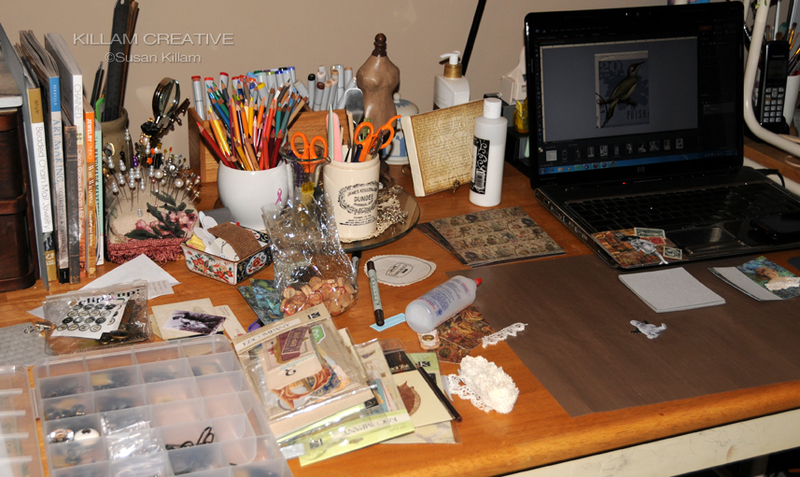 I need space around me and clutter clouds my creativity. (Sounds hoity toity, but isn't, really.) Anyway, here it is with mostly one project taking up all the space. Wowza! It's all about my 11-page Alter Ancestors Little Fat Book Swap pages. In the bottom right corner you can see 4 completed ones, and the rest of the table has ancestors in various states of undress. The blog post below this one has close-ups of the 4. 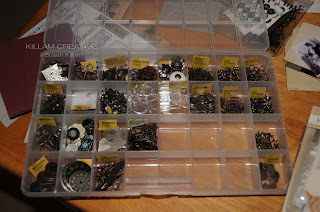 Oh, and the left corner holds my camera project - I'm taking an old camera apart to see what's inside. Lot's of fun little bits! I need a micro screwdriver to finish and take the lens apart, though. That's for another day! 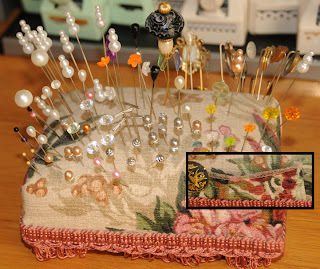 In other WOYWWs I was asked about this pin cushion. I got it from Husband's grandmother and I think it might have been made by his grandfather. Or both, I don't know. The back has a little pocket for stick pin clutches - see the inset. The base is just wood with blocks for feet. Luckily the trim covers the feet. :) I think this would be very simple to make. So, that's it for today's WOYWW. Happy day to you and thanks for visiting! Hello blogging friends! I'm really excited to share a project with you, or at least parts of it. Over at the All Things Tim Yahoo group I'm in an Altered Ancestors Little Fat Book swap. There are over 20 players and each of us makes 11 pages to send off to our swap coordinator. She then randomly picks pages to bind into little fat books and sends to the players. I don't even know if my book will include any of my own pages! Here are 4 of my pages - still have 7 to go, but they're in various states of unfinished-ness. *ahem* The idea is to use Tim Holtz products and alter old photographs. I love this one. The stamped image is a New York Central train schedule (or something like that). 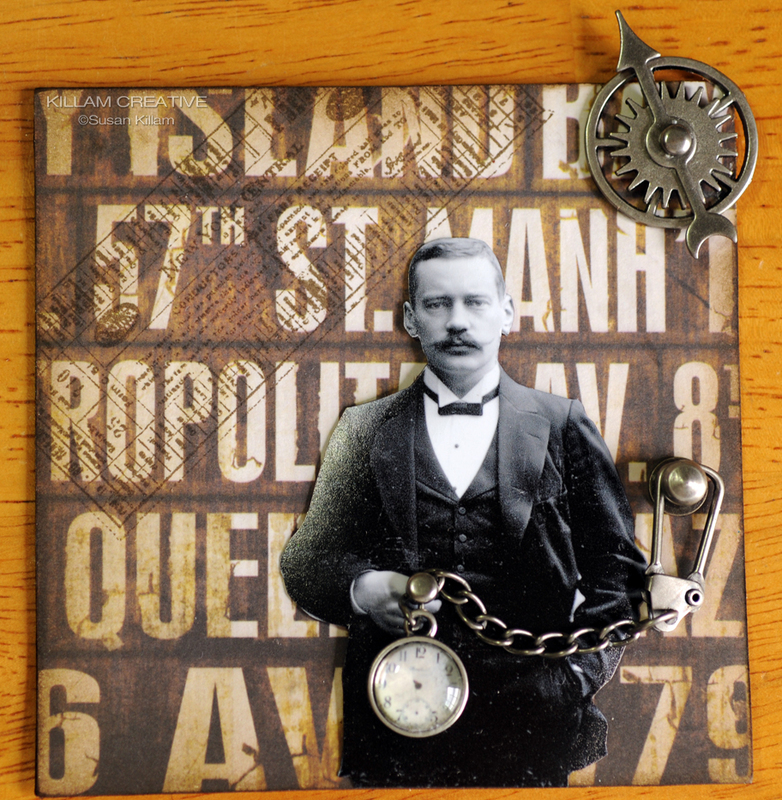 The pocket watch is made from Tim's Type Charms and a tiny clock face cut from one of his Lost & Found papers. When I saw this image I immediately though her hair could host a nest. 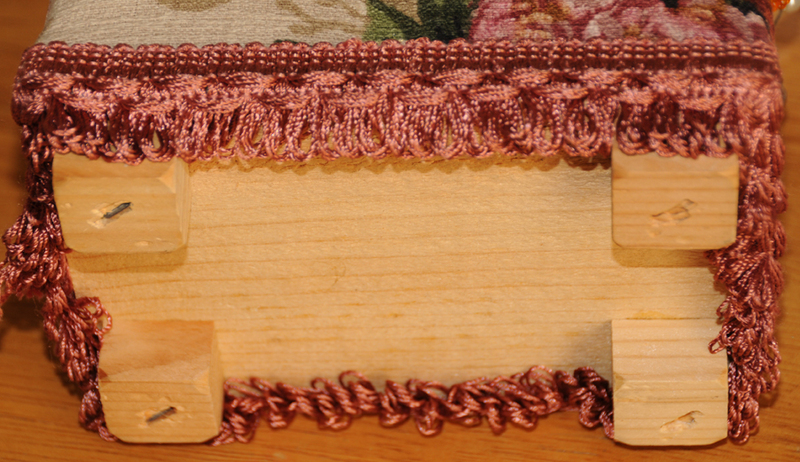 I futzed with a few different nest materials and eventually settled on this May Arts netting in two colors. The eggs are a vintage image covered in Glossy Accents. On this page the bird and paper are TH. Such a little angel! I picked this paper then set out to find an image to work with it. There are tons of public domain vintage images online, but I fell in love with this little one. Her wings are made from elements found in the Mixed Mini's grungeboard pack. I painted first with pearl Lumiere paint then used a small paint brush dabbed on a Peeled Paint Distress Ink pad to sweep along the top half of the wing. I then added Rusty Hinge Distress Ink on the top 1/3 of the wing. I love the effect! The "cloud" is vintage tatting and the Mixed Mini's grungeboard letters are colored first with a mustard-y alcohol ink then covered in German glass glitter. This on is my second favorite... or maybe my first. I don't know! The wings are printed on Cryogen Irridescent paper and are sparkly in person. I used TH tissue tape and cut little letters from the Lost & Found paper pad. So, the pages are 4"x4" and the left side is for the binding rings. The photos were printed on a satin photo paper (just what I had on hand) and cut out. I rounded them for a little dimension and used a silicone as glue so they're all raised off the page a little. The pages are grunge paper with TH card stock attached on the front and back. I'll show how I did the (very boring) back sides when I post more pages. Thanks for visiting and reading this novel! If you're new 'round these parts be warned: I'm wordy and waffle a lot. If you are a regular visitor you're probably thinking you clicked on the wrong blog. 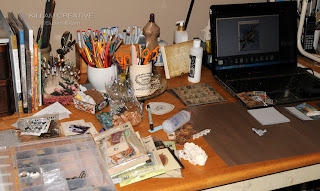 What you're seeing is me growing as a mixed media artist. I hope you like! 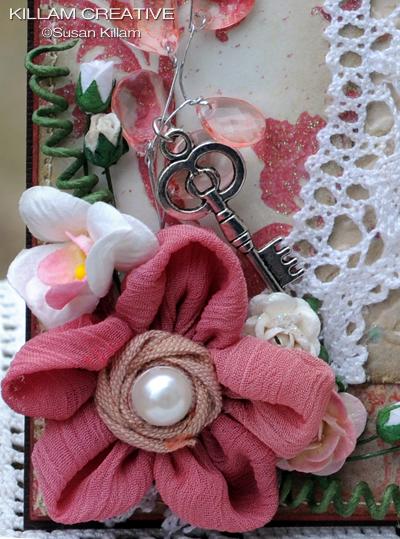 No worries, though - I'll still continue with my frou-frou vintage and Magnolias. I couldn't be "here" without them! Hello dear friends and happy Monday! 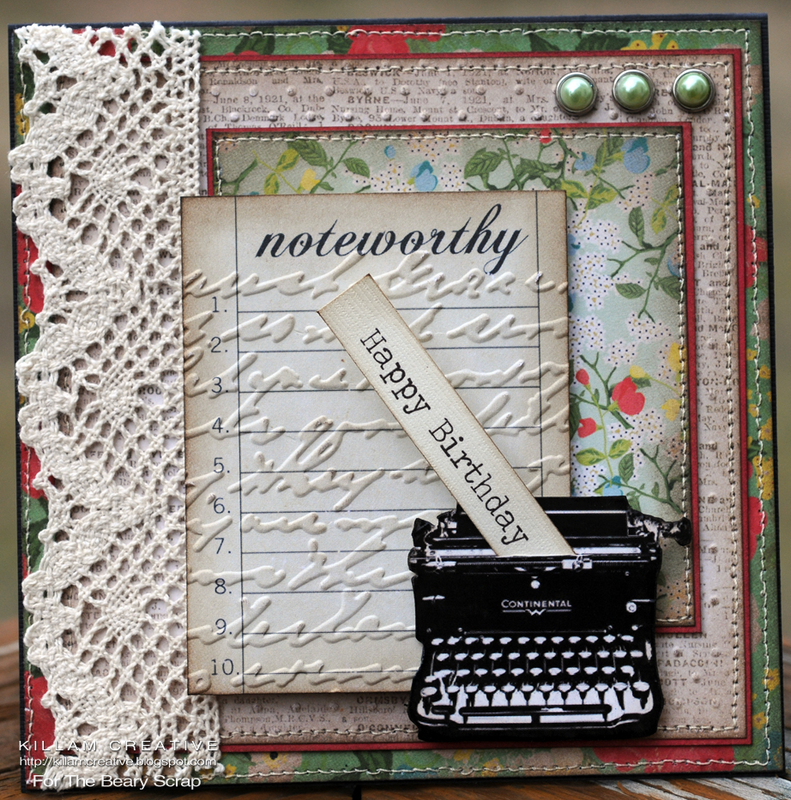 This week the Beary Scrappy Gals are continuing to show samples using our current challenge theme. We're adding a little extra, too! 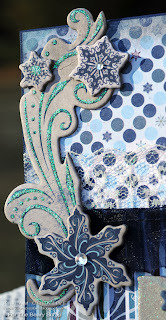 Lately I've been focusing on embellishments that match the paper line. On my last two cards I used elements cut out from the 12x12 papers. 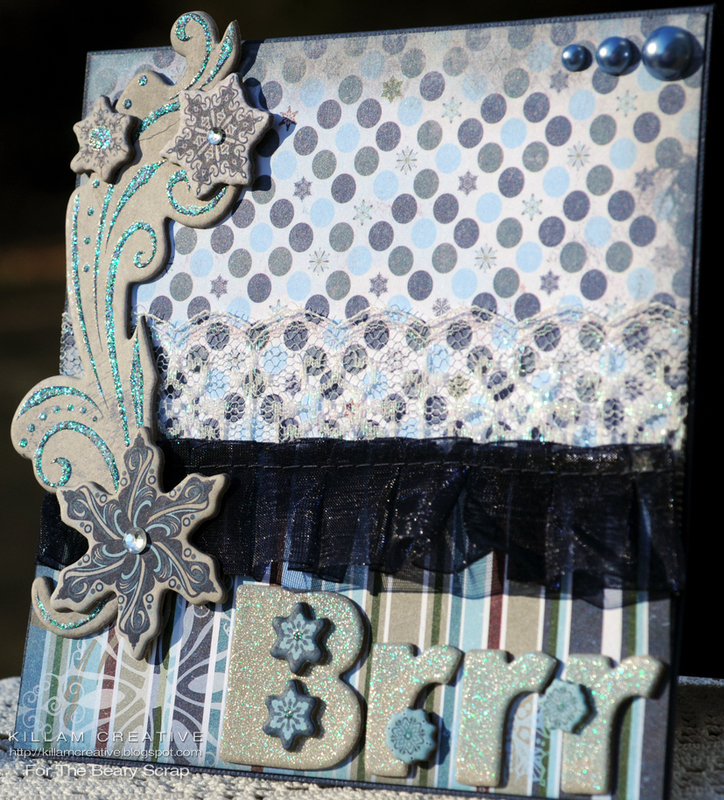 For this card I looked no further than the wonderfully coordinating embellishment packs made for Bo Bunny's Midnight Frost line. This was a quick card - everything fell into place at lighting speed. With these fabulous chipboard embellishments I was able to add my sparkle (with a little extra thanks to Stickles on the swoosh) easily. Both the blue ribbon and white lace are Midnight Frost Wraps - see the sparkle on the lace? Yea, it came like that! Yay! On the inside I plan to use a sentiment along the lines of "Baby it's cold outside... let's snuggle". Hmm, sounds kind of silly when I write it out... any suggestions on better wording? I used Crystal Stickles on the swooshes to enhance their sparkliness. They were already this green-y color but I kicked it up a notch. No enhancement necessary on the "Brr" - it's great as is! The base card stock is Bazzill Basics - have you seen that all Bazzill is on clearance at The Beary Scrap? 50% to move it all out and make room for new and exciting STUFF! Don't forget we still have our Guest Designer Call going on through March 5th. We know you're all busy making projects using our GD sketch and we can't wait to see 'em! Hello friends! I hope you are having a beautiful weekend. We're quite windy here but the sun is shining! Today I want to share a tag. It's my second one, and I can definitely see more in my crafty future. :) I love the femininity and color combination. The bird is from a Tim Holtz die, the music is TH tissue tape, swirls and fabric flower are Prima. The metal flower is also Tim Holtz, on which I used Ellen Hutson's enamel metal embellishment technique for the February challenge. The paper is from a DCWV stack called Be Mine I bought before Valentines Day *last* year. It was pulled from my huge destash pile when I discovered it had the perfect paper for the tag base. If I don't get rid of this stuff soon it'll all end up back in circulation (but never get used). Ha! 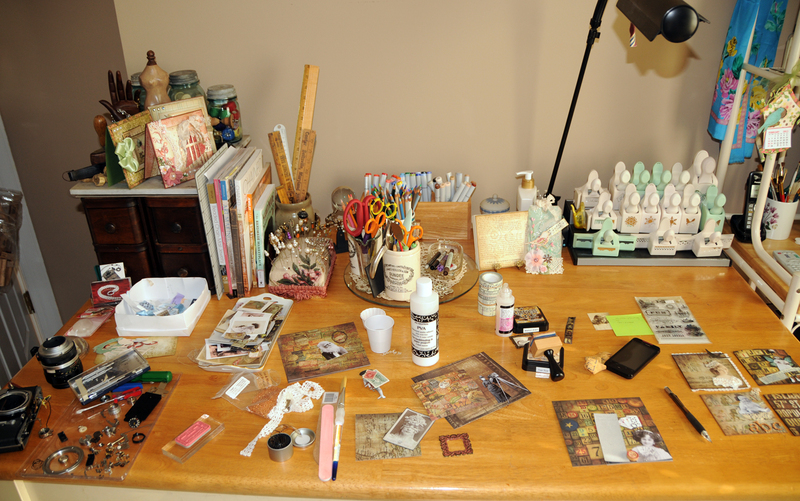 So, the lovely Allison of Stampin' When I Can has a cool blog. Not only is she fun to read, she's *all* about sharing with her readers all the great stuff she's found around the Internets. She has a great list of current challenges as well as links to a bunch of free sites - CDV, digital images, cutter. She doesn't know me from Adam. I don't know if I ever commented, or I certainly haven't in a long time. 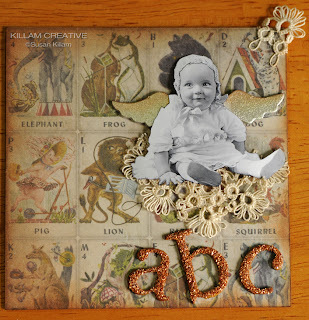 The other day she entered our sketch challenge at The Beary Scrap and I commented on her entry to thank her. 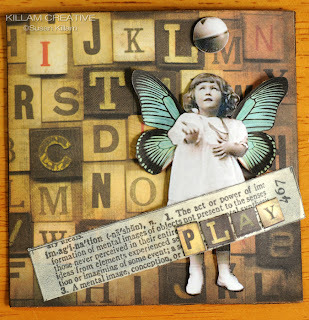 Of course, the kind and polite lady that she is came to visit me and ended up sharing my Fairy Wings card (below) on her new blog called Share the Mojo. Share the Mojo is a great site! It's brand new and has all kinds of inspiration and eye candy in one place. It's wonderful to see so many styles! The best thing about it is you can share the mojo, too! All you have to do is add a link to any project using the Inlinkz gadget. It's not a contest; there are no prizes. You don't even have to leave your name. All you need to do is share. 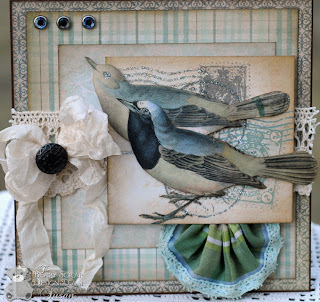 Speaking of us, have you seen our Guest Designer call? It's going on through March 5; we are looking for 4 Guest Designers - come check it out! On to my sketch sample. Today is the last day to enter the sketch challenge. Yes, I am the caboose! This is made almost entirely from Graphic 45's Once Upon A Springtime. I edged the layers with Distress Walnut Stain ink using the Ranger Blending Tool. I added Stickles to edges, the center image and the flower centers. Kaisercraft pearls are up in the corner and finish off the flower centers. I cut the pink flowers from a sheet found in the 8x8 paper pad (the leftovers from the layer between the solid card stock and the green flower design). 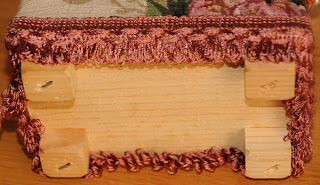 I used the same edge rounding technique found in a tutorial here; this time the rounding is done mostly on the front of the image instead of the back. 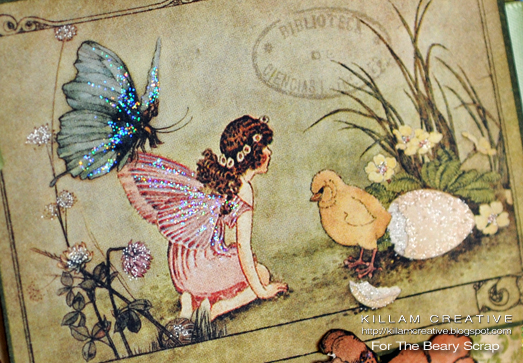 Here you can see the Stickles on the fairy and butterfly wings, as well as the flowers and egg. For the wings, I just swept the Stickles applicator out to create delicate lines. It's OK if you put too much on - just wipe of *quickly* and try again. 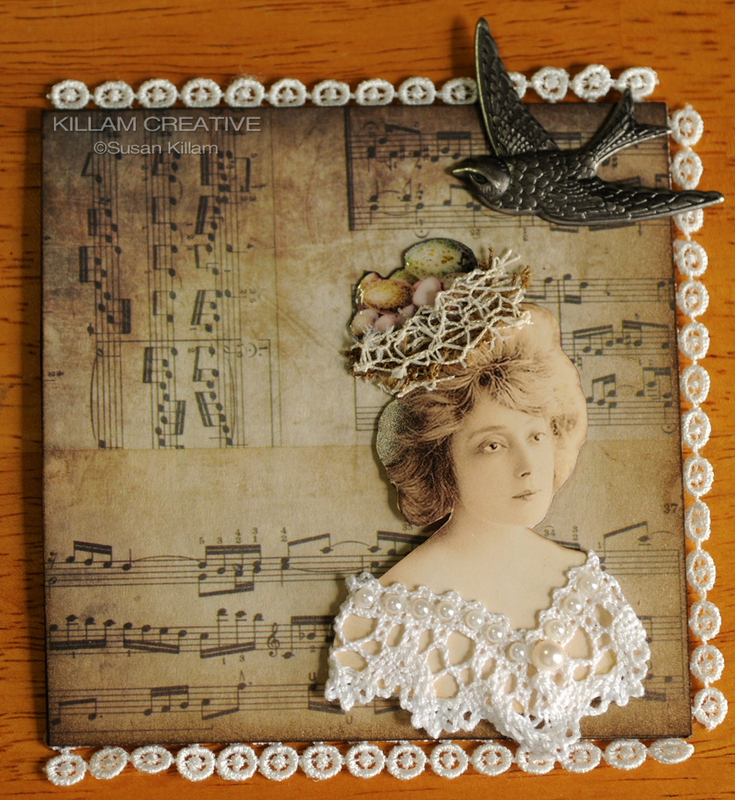 I really like the versatility of this paper - there are pages with postcard designs like I've used above as well as a 12x12 sheet chock full of card stock embellishments. The papers, both in full-size and an 8x8 pad are stunning. I'm sure I'll be cutting and layering fairies and butterflies (and even a frog prince!) on another card soon. Thanks for visiting today! There's still a wee bit of time to get crafty with our sketch challenge. Come check out our Guest Designer call - we are looking for all talent levels! I'm all hot and heavy on an Altered Ancestors Little Fat Book swap. I'm having a blast pulling my "instant ancestors" together. I can't wait to see my pages, much less the finished book that will be sent back to me with one of my pages and a bunch made by fellow swappers! Handy dandy T!m Holtz embellishment storage. I was so happy to put it all into this container - the packaging takes up so much space! So anyway, that's it for now. If you want to play along and have a snoop around work spaces all over the world, check out the Queen of Snoop right here! Thanks for visiting! Last week I did much better visiting other WOYWWers, but still didn't make it through to all 150+. It seems I've joined a quickly growing movement! TBS DT: Love Birds Get Sketchy! As I write this Sunday night I am distracted by a football game. Well, to be honest I couldn't care less about the game but I do love watching the adverts. So far Doritos has done quite well. The Chevy truck "Timmy fell down the well" ad had us in stitches and I enjoyed the Coke ad featuring border guards - it was cute. So, this week the design team is continuing with the BSC #19 sketch, and we're adding "plus fabric" to our projects as a little twist. I used the delicious My Mind's Eye Portobello Road collection. All four layers of paper are different designs within the line, and the birds are cut from the Love Birds paper. My fabric bunting is made from upholstery fabric I used for my family room pillows. I finished the edge with a scrap of seam binding and then sewed the blue crocheted lace from the "Party Trims" accessory pack (after I separated it from the crepe paper). To be honest, it was labor-intensive. Important reminders: Our Guest Designer Call is going on now through March 5! We are choosing 4 guest designers to serve 3-month terms. Go to this post on our store blog for all the details! 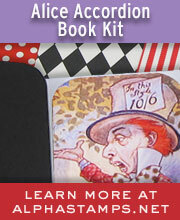 Also, the current sketch challenge is open through February 14. Go here all the details. See you there! [Edit] *ahem* It's Monday morning and seems I was distracted enough last night to disable comments on this post. Oops. It's fixed now. My Mind's Eye/Lost and Found/Union Station! This line is a hot seller at the store and now you have a chance to win a complete kit for being a Facebook fan! (See more details below.) 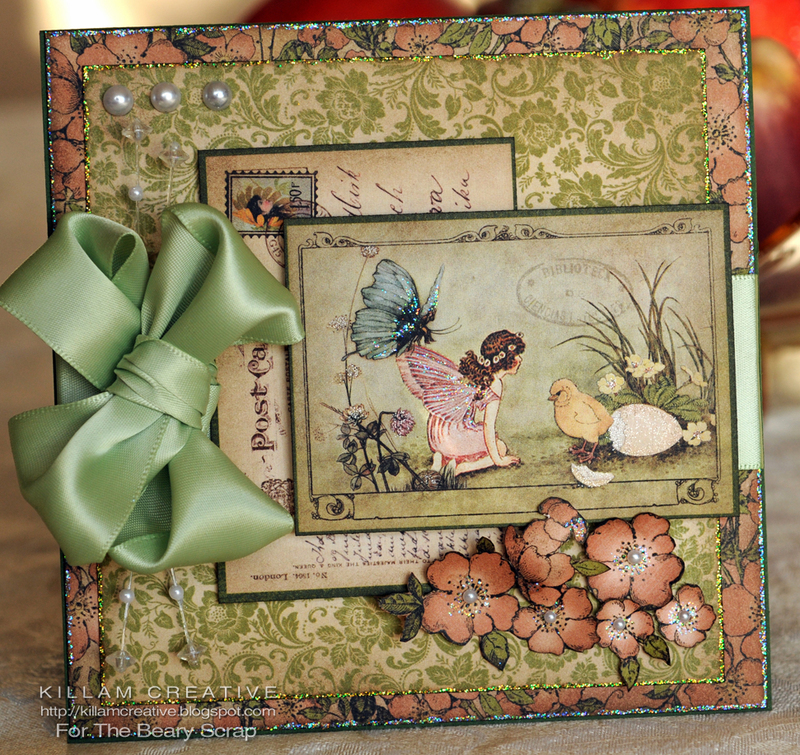 The kit includes one of each paper design and *all* the embellishments - can you believe it? Click here and join the fun. Be sure to answer the question at the Giveaway Post on Facebook before 10PM EST and you could be a winner! I had to shovel off the floor to vacuum, so here's the Desk of Destash. Or, the desk of de stash... but that makes it sound good and I need to move it along to another home. Ha! 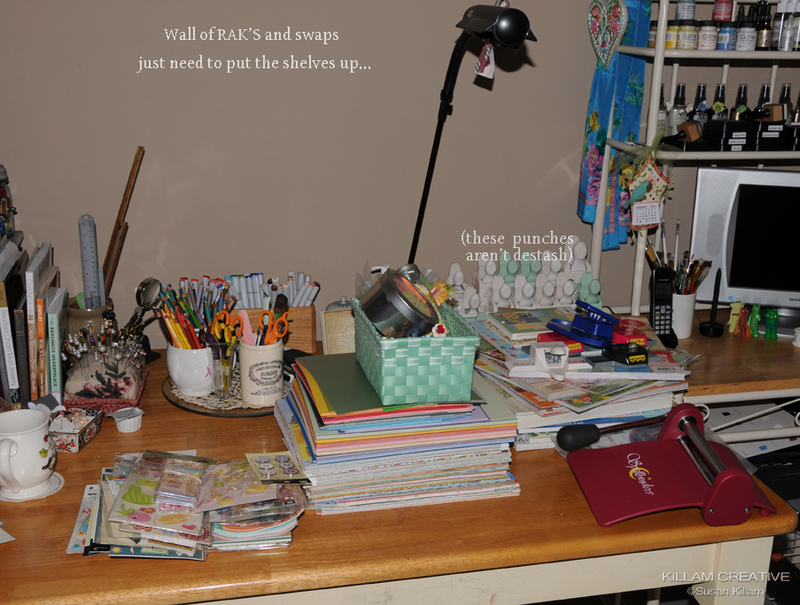 I reorganized and had to admit that while I love hoarding supplies, I just won't use all of it. It's been sitting on the floor for a couple of weeks. I now have loads of printed and solid papers, along with loads of paper pads I used once or twice at the most... and a Spellbinders Wizard. 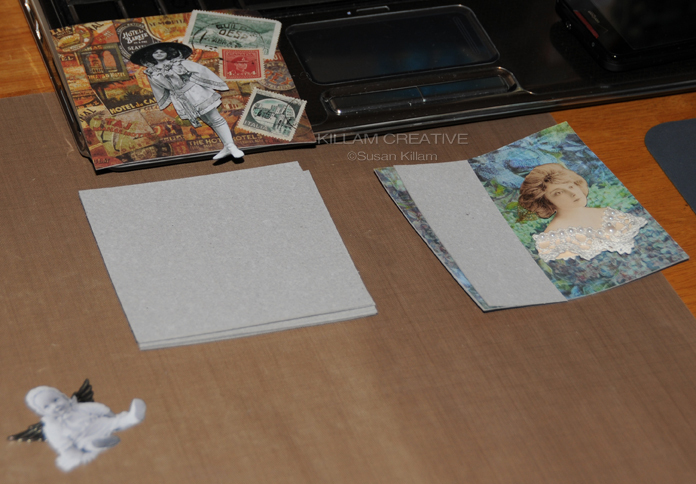 ...And stickers/dimensionals, paper flowers and a couple of punches. Good night! Why did I think I would use all this stuff? Want to have a snoop around other desks? Join us over at the Stamping Ground and see what a fab bunch of creatives our host Julia has gathered around her. It's fun! 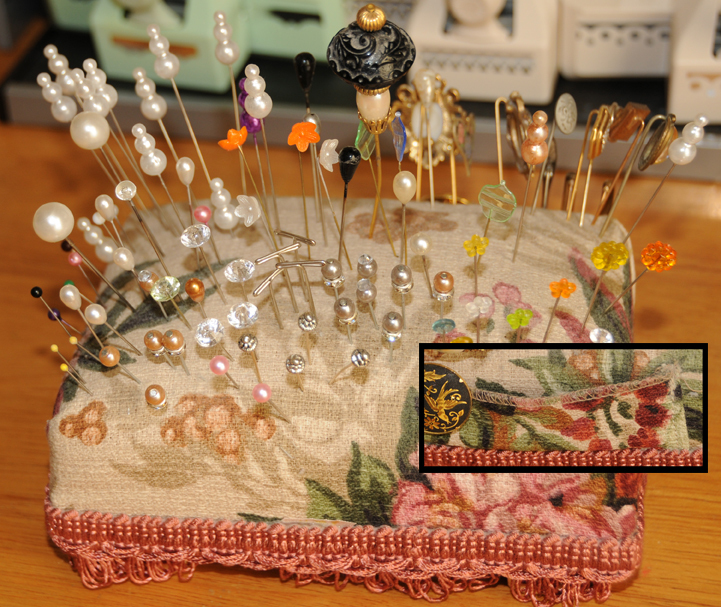 The fabric flower is Prima with an added pearl center, and the orchid is a Magnolia flower. The roses and rose buds are from The Beary Scrap. You can only see a little of the gem branch in this photo, but I have a story to tell about it. I originally bought a 6' clear garland at a Big Box Craft Store and cut all the little branches off at the main base. Whenever I need a gem branch I color it with Copics (or other alcohol ink) to match the project. Cool, huh? Especially when I used a 40% off coupon - made it $6 and I have a TON of branches! The heart was a true labor of love. 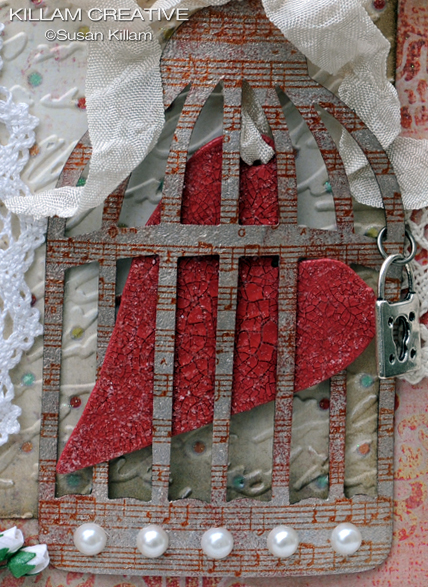 It's made of a Grungeboard die cut and originally painted with Worn Lipstick Distress Crackle Paint. Once dried, I decided it needed to be shinier and covered it with Glossy Accents. Of course, I forgot Glossy Accents tends to change some colors, and the pinky heart turned into an orangey heart. Blech. I flipped it over and started again - more Worn Lipstick and another day to dry. This time I used a thin layer of Rock Candy Stickles on top to give it a bit of shine. Perfect! 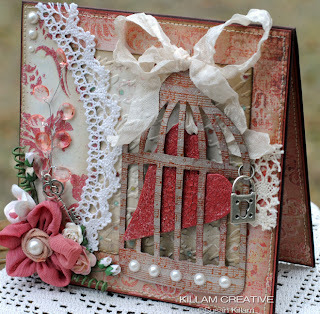 This delicious cage is cut from Grungepaper using a Tim Holtz die. I painted the cage with pearl Lumiere acrylic paint and it turned out too silvery. I then took a blob of Lumiere Halo Pink Gold on a makeup wedge and dabbed here and there on the cage. Once that dried I decided it needed more... 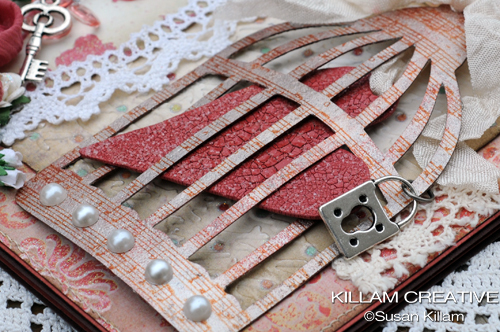 I used a Prima music stamp with Archival ink in Russet on the cage. Phew! I'm done! PaperPlay #4 (2/2) - Layer it up! 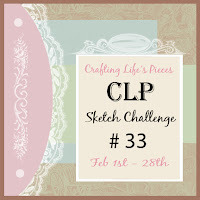 City Crafter #42 (2/7) - Love Is All You Need - Use a heart or the word "love"
To get you started, here is Chelsea's beautiful CLP Challenge sketch. I hope you can use it and join our challenge! This month we're sponsored by Chelsea's own Gurlee Girl shop. You could win a $20 gift card!